I tend to always be preoccupied with something or other when I’m outside, which is not the best possible mindset when camping in the Great Southwest. I had just returned from a hub test on the Aurora, followed by an impromptu exploratory ride further south along Vulture Mine Road to check out some recently closed campsites. 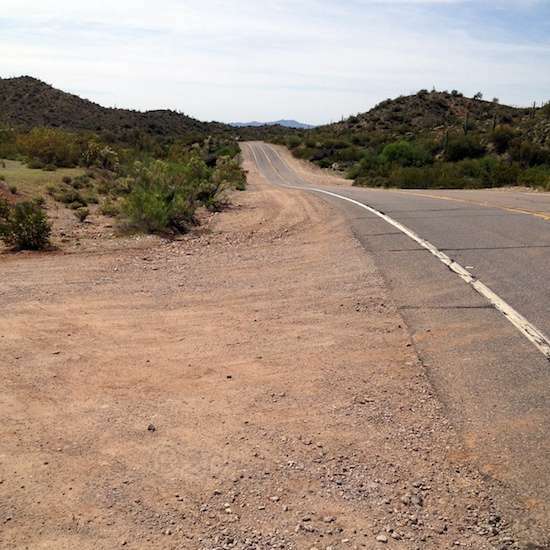 I parked the bike and stowed my sun gear, then shuffled toward the trailer door, key in hand. No, I did not scream like a little girl. Not loudly, anyway. I was still about 5 feet away, and was surprised at the effectiveness of its camo. Once I moved further right, toward its rear, it silently glided between and behind the trailer’s tires. I was able to finish my business with the e-bike’s battery and go in. It had remained silent and still, and I have a suspicion that it may have been a Sonoran Gopher Snake, which is non-venomous. 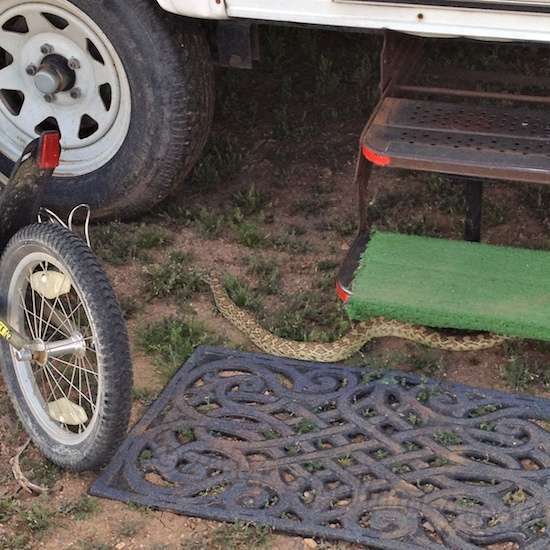 Even if it were a rattler, I would be very reluctant to kill it unless it proved a lingering nuisance under the trailer’s door. I’ve forgotten the State Land Trust’s policy, but I’m for anything that either eats or repels mice. I haven’t had any rodent problems here, but it’s the principle of the thing! I’m kinda off by myself, so I don’t see an issue with camper or pet safety as I would along an LTVA road. Live and let live. Just don’t scare the elderly suburban nature ignoramus. The Box Wash camping area is no more. 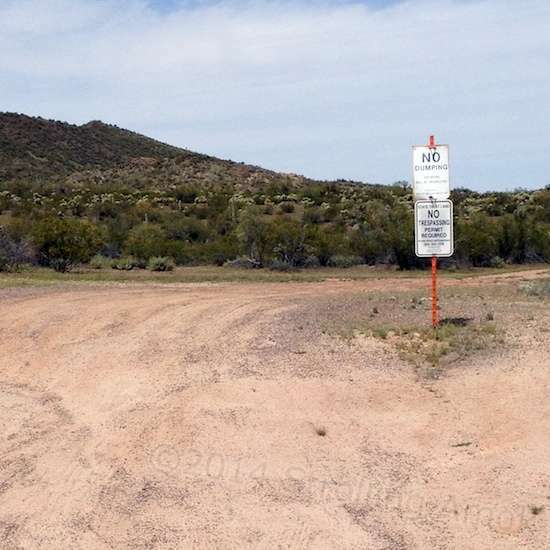 The closed campground is probably called Box Wash, since that wash is immediately north of it on Vulture Mine Road. From what I gather, Maricopa County has had this closure percolating for quite awhile. That’s too bad, since apart from cacti making life miserable for wandering pets, it was an okay campground. Now, the path in is restricted to hikers. Not even bicycles are allowed in. I suppose the large circle at the entry could be pressed into service as an overnight, but it’s right next to the road. Why show the entrance rather than the nice little camping area, you ask? I’m not sure. Much closer to camp, I also found another State Trust stub ending in a large loop on level and pleasant ground. Given a careful angled entry off the highway, even the tail-dragger Defiant could probably get in mostly intact. This is one of those areas to stay awake in, though. An abrupt drop-off right after the attractive loop is sharp and narrow enough to scrape the Ford’s paint on bushes, and this former Jeep trail quickly peters out after some rugged ground not suited to the Ford’s long wheelbase. The Aurora took it all on, though the final climb to get back to the loop had me ready to bail if that front wheel followed through on what it was threatening. It was a bad place to stall out, but a little momentum and a lot of throttle got it over with quickly. There’s actually a ton of cacti spread all over the lower areas. This jaunt inadvertently turned into a seat evaluation too, but rather than combine too many topics like I often do, I’ll get to that later. 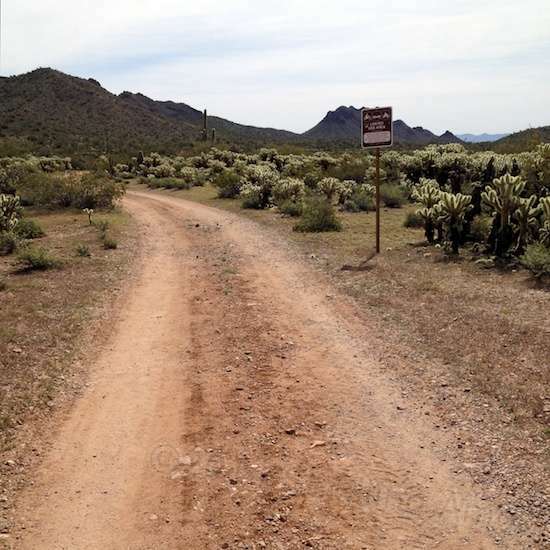 I will mention that the trip along Vulture Mine Road gets much more visually interesting the farther south from Wickenburg you go, and it finally sunk in why a few hardy souls (who can often be seen cycling through Wickenburg) go cross-country on bicycles. It’s a much more immersive experience than flying past the vistas in a glass-lined viewbox. I would have been too distracted to notice last year, wheezing and chuffing on my old Raleigh. This time, I was able to just pedal and look around. The scenery was quite arresting, which the photos do not even begin to convey. I can now see the allure of pedaling and camping and/or moteling. 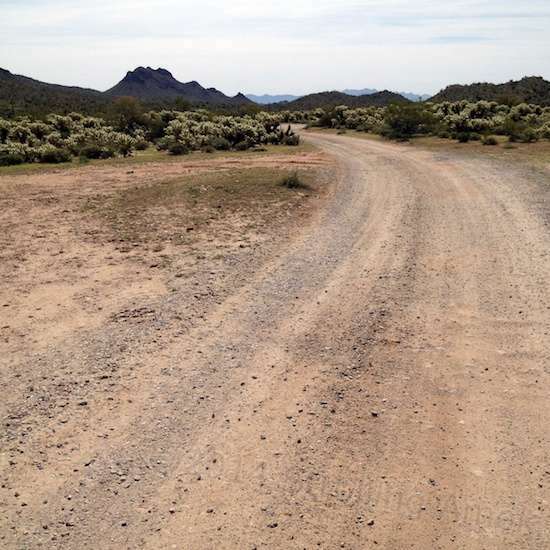 I’d fear for my life on most two-lanes though, but this one is 40 MPH with wide dirt shoulders available. 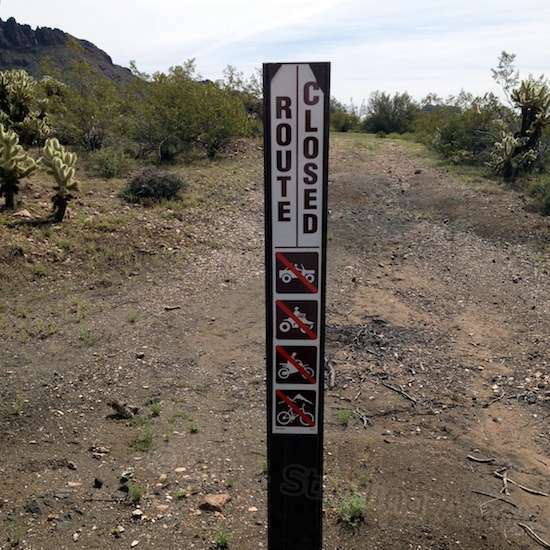 I’m going back to bike the Jeep trail part of the trailhead once this mini-heatwave is over. Beeeoootiful! I kept stopping to look, more interested in taking it all in than in trying to capture it in electrons. Care to set up camp in here? Fun adventure. After I get a bit more experienced I may try some boon-docking. I’m still learning about and learning to trust or distrust my used RV. Well, there is that, isn’t there, JR? If there are any relatively cheap commercial RV parks in your area, a few sporadic weekend stays would be a good intro. Some areas have forest preserves for a few days of affordable boondocking. Then if you decide to widen your scope and everything appears shipshape so far, you can go cross country mixing truck stops, rest areas, Walmarts, commercial parks, national forests and whatever else you can dig up. For the first year at least, you may want to consider Coach-Net insurance, which is like AAA for RVs. The first year tends to be the discovery stage, as you now suspect! I have a coach net style service. It’s through Good Sam Club. This is a bus and the tires are huge. If I have a flat I’ll have to have a service. I’ll probably spend a year learning like you say. I’m just getting a bit less terrified driving. lol I have stayed in cheap campgrounds. I have yet to try a Walmart but one is on the horizon. 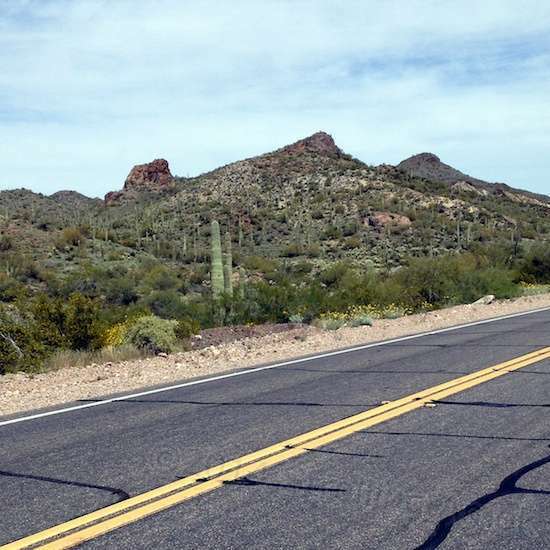 I agree with you about the beauties of Arizona. So many people think the desert is strictly rock and sand. Your pictures are great! Although… until you’ve actually been out here, I don’t know if you can truly appreciate the vastness and the beauty. I am currently on the other side of town from you. Well. Catty corner maybe. I am on the north east side of town. 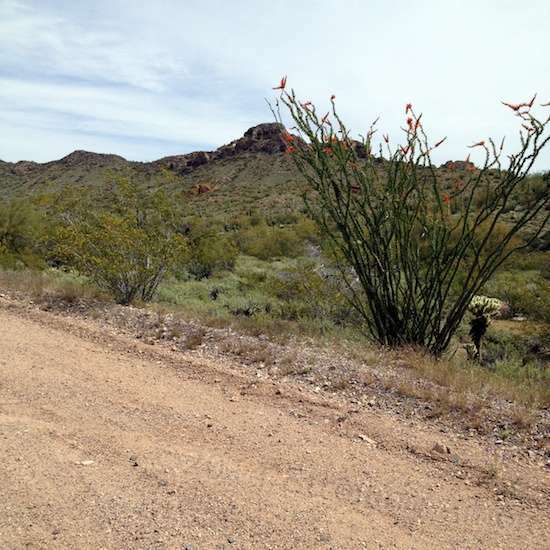 I don’t know if it’s because there’s a slight difference in elevation but we do not have the cholla cactus where we are. I know they do by the Vulture peak trailhead. That is where my little Macha had her run in with one of those terrible cacti! Like the pics and story. I see you have friends that are snakes too……….but, HA!….the two legged ones I work with are much more dangerous……..